When we use waste pyrolysis machine to extract oil from waste tires, we often get another by-product, carbon black. The use of carbon black from tyre pyrolysis is quite wide in many fields, which will surely bring your investing cost back very soon as well as bring you great profits. 1. The pyrolysis carbon black can be directly sold at a quite great price in the market. 2. The carbon black obtained from tyre pyrolysis plant can be used to make construction bricks with clay by briquette making equipment. 3. It can be used as heating materials to supply heat energy. 4. Deep processed into high-quality N220, N330 carbon black by carbon black processing plant, which will have wider applications and higher value. 5. Further processed into color master batch as basic material to make pipes, cable jackets, etc. 6. Made into pellet or briquette for burning. 7. Attached into heavy metal to improve the quality of soil. 8. Used to make carbon black bars by using carbon black pellet machine. 9. Grinding to increase the mesh of carbon black by carbon black grinding machine to make new tires, painting materials, etc. The carbon black from tyre pyrolysis uses add higher added values into the pyrolysis equipment, which makes the equipment more profitable and beneficial. Moreover, the other end products, both tire pyrolysis oil and steel wire also have various applications, which can bring you endless profits. 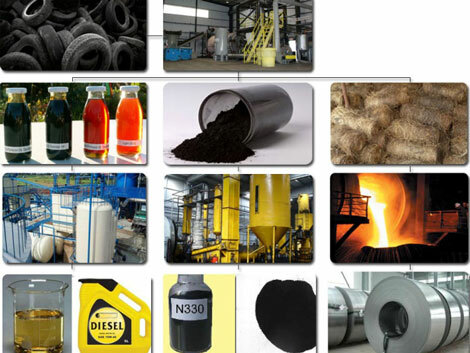 To get more high-quality carbon black from waste tyre pyrolysis and make great profits from this project, we should ensure the pyrolysis machines have these characteristics: safe, energy-saving, environmental friendly, high efficiency, durable… Beston also has supporting equipment, oil refining plant to further distill tire oil to diesel and carbon black processing machine to further process carbon black. 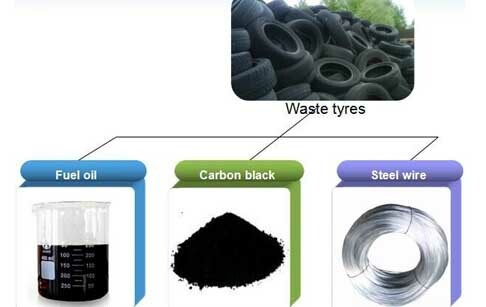 The carbon black can not only be obtained from waste tyres, but also from plastics, rubber, medical waste and so on. We can supply the whole waste recycling system from waste to wealth. Please don’t hesitate to contact us at any time if you are interested in it!